Perlier Shower Cream Quad with Sponges - 8.4 fl. oz. Choose from four alluring fragrances in this shower cream set that also comes with two sponges. Ingredients: Aqua (Water), Sodium Laureth Sulfate, Cocamidopropyl Betaine, Mel (Honey), Lauryl Glucoside, Parfum (Fragrance), Sodium Rice Amphoacetate, Sodium Chloride, Polyquaternium-7, Citric Acid, Caramel, 2-Bromo-2-nitropropane-1,3-Diol, Tetrasodium EDTA, Coco-Glucoside, Styrene/Acrylates Copolymer, CI 19140 (Yellow 5), CI 15985 (Yellow 6). Ingredients: Aqua (Water), Sodium Laureth Sulfate, Sodium Chloride, Parfum (Fragrance), Lauramidopropyl Betaine, Citrus Aurantium Dulcis Juice (Citrus Aurantium Dulcis (Orange) Juice), Citrus Medica Limonum Juice (Citrus Medica Limonum (Lemon) Juice), Citrus Tangerina Juice (Citrus Tangerina (Tangerine) Juice), Vaccinium Myrtillus Extract, Saccharum Officinarum Extract (Saccharum Officinarum (Sugar Cane) Extract), Citrus Aurantium Dulcis Extract (Citrus Aurantium Dulcis (Orange) Fruit Extract), Acer Saccharinum Extract (Acer Saccharinum (Sugar Maple) Extract), Citrus Medica Limonum Extract (Citrus Medica Limonum (Lemon) Extract), Sodium Benzoate, Styrene/Acrylate Copolymer, Coco-Glucoside, Tetrasodium EDTA, Citric Acid, Limonene, Linalool, Geraniol, Butylphenyl Methylpropional, CI 15985 (Yellow 6), CI 16035 (Red 40), CI 19140 (Yellow 5). Ingredients: Aqua (Water), Sodium Laureth Sulfate, Lauramidopropyl Betaine, Sodium Chloride, Glycerin, Olive Oil PEG-7 Esters, Parfum (Fragrance), Olea Europaea Oil (Olea Europaea (Olive) Fruit Oil), Hydrolyzed Tomato Skin, Sodium Benzoate, Styrene/Acrylates Copolymer, Coco-Glucoside, Citric Acid, PEG-55 Propylene Glycol Oleate, Propylene Glycol, Tetrasodium EDTA, BHT, Benzyl Salicylate, Citronellol, Hexyl Cinnamal, Linalool, Hydroxyisohexyl 3-Cyclohexene Carboxaldehyde, Eugenol, Geraniol, Limonene, Alpha-Isomethyl Ionone, CI 42090 (Blue 1), CI 19140 (Yellow 5). 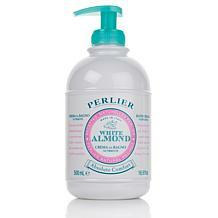 Ingredients: Aqua (Water), Sodium Laureth Sulfate, Sodium Chloride, Shea Butter Amidopropyl Betaine, Glycerin, Lauramidopropyl Betaine, PEG-75 Shea Butter Glycerides, Parfum (Fragrance), Butyrospermum Parkii Butter (Butyrospermum Parkii (Shea Butter)), Coco-Glucoside, Glyceryl Oleate, Prunus Amygdalus Dulcis Extract (Prunus Amygdalus Dulcis (Sweet Almond) Fruit Extract), Sodium Benzoate, Glycol Distearate, Cocamide MEA, Tetrasodium EDTA, Citric Acid, Laureth-10, Methylparaben, Butylphenyl Methylpropional, Linalool, Benzyl Salicylate, Amyl Cinnamal, Coumarin, Hydroxyisohexyl 3-Cyclohexene Carboxaldehyde, Limonene. Perlier has been a favorite and staple in my linen closet for years. I always give it for gifts for the holidays and they are always singing praises. The scent is there but never too overbearing and it leaves your skin soft and moist with a touch of fragrance. Truly quality products!!! Got a good buy. Scents are nice. Lotions feel great on skin. Could be larger size- it goes fast. 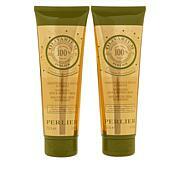 I do love Perlier bath products for their scents and extreme moisturizing. My skin feels and looks healthier when I use it. This four pack is a bargain at about $10 a bottle. I would have given 5 stars, but the two squeegees arent put together. Immediately they unravel into a stream of net. I did not feel clean after using some of the items. The smell did not agree with me nor does it stay with you. I had also issues with itching on my body., so I am going to have to return. Everything is always advertised as natural ingredients but I am afraid there is chemicals and parabens in these products . I am coming to the conclusion that my bath and body does not benefit me ordering on shopping network unless I am totally familiar with what it is. Packaging not up to par.